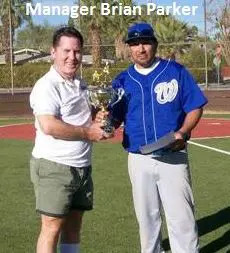 The Warriors, with their ten-plus years of MSBL tournament experience, were attempting to win their third Desert Classic championship. The OC Waves of Downey, California were making their first Classic championship game appearance after just four attempts. The Las Vegas Warriors voiced the same sentiment about team effort getting them to the championship. When asked if a particular player stood out in the tourney, Warrior manager Brian Parker responded, “everyone“. The winning formula for the Warriors in the championship game was solid defense, timely hitting and pitcher Vic Darensbourg. In the first inning the Warriors scored two runs on a sacrifice fly by Parker and a subsequent throwing error scoring the second run, which proved to be the eventual game winner. The Warriors tacked on six more runs with an RBI double by Larry Hamilton in the third while in the fifth Matt Brown singled and scored. Danny Flores scored on a Francisco Vargas two base hit adding another run. The final three runs came from a Mike Cedroni RBI base hit, a Mark Cunnahan sac fly, while the eighth inning lead-off batter was cashed in for the final run. The Warriors’ pitching staff, which catcher Pettrey called “just incredible,” gave up only 14 runs the entire tournament. After relieving pitchers Tony D’Andrasio and Dan Flores in the semi finals, Darrensbourg pitched a complete game, giving up just one run in the championship win against the Waves. The Warriors claimed their third Desert Classic Championship.